Who Doesn't Feel Like Cake? Last summer this time, everyone was telling me they hoped I got a girl, so I could have some fun dressing her up. I always protested (truthfully) that I love sewing for my boys, but I had to admit that a girl would present some great stashbusting opportunities. Case in point, a gorgeous border print skirt that's been in my sewing pile waiting for a new life. It's been too big for me for years (hard to complain about that), but I never quite got around to downsizing it. A total remake, though, was too fun to resist! 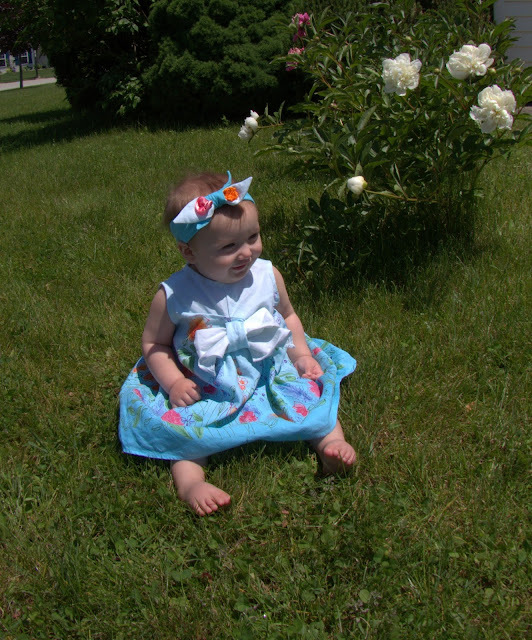 My pattern inspiration was the Bow Dress from Pattern Magic, but I drafted my version to make it work for this upcyled project, and added lots of room to move for an almost-toddler. It was fun to work out the engineering for this project. The front and back are each cut all in one piece, with the front bodice twisting around itself to form the knot for the bow. I kept the original skirt zipper, moving it to the center back. The back bodice is shaped with inverted pleats, which allowed me not to waste an inch of that pretty print! 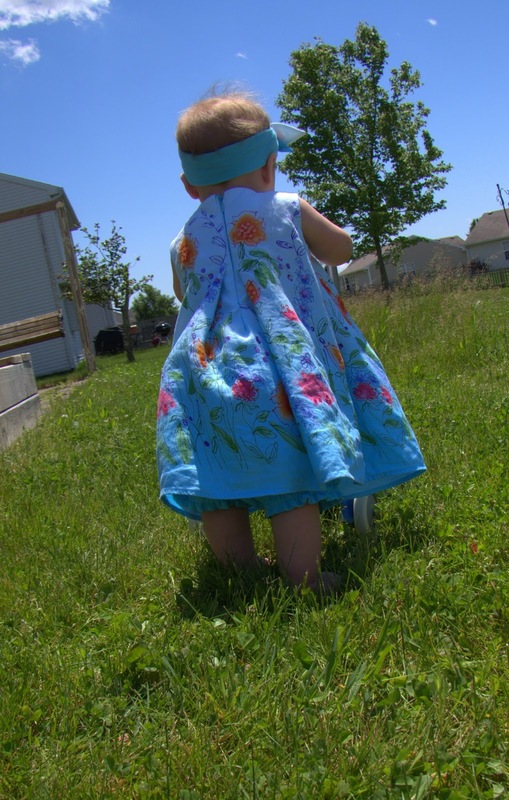 The skirt lining became the bloomers, cut from a vintage (and by vintage, I mean my age) pattern. Even for babies, pattern sizing isn't what it used to be; this one said "newborn," but I can even get it on her over a cloth diaper! I liked the more shorts-like fit of this pattern in particular; with any luck, this outfit may still work as a top and shorts next summer. I had just enough left over to top it off with a bow headband, and even found some ribbons in my box that matched the flowers in the print exactly. Total cost for this project was zero! All I needed aside from the skirt was some leftover bias tape for the facings, and ribbon scraps for the headband rosettes. For more sweet May Florals, check out the Project Run and Play link-up! I'm on a low-salt kick for the duration of this pregnancy, which means pretty much no packaged anything (Fig Bars and Shredded Wheat are about all I've found). The last thing I feel like doing is baking, though, so Cuisinart to the rescue. I knocked out all four of these in less than an hour, and just gave the processor bowl a thorough scraping out between batches. I also fit everything into the same large loaf pan, with layers of waxed paper in between. Also #livingoffof: homemade Lärabars, because #nobake, that's why. L to R: carrot cake, cherry pie, dark chocolate brownie, and apple pie. If your fruit is particularly dry, soak in warm water 5-10 minutes before beginning. Line a 9"x5" loaf pan with plastic wrap or waxed paper and spray with nonstick cooking spray, Place nuts in a food processor and chop finely (about ⅛" pieces). Add fruit and spices. Pulse until mixture comes together in a ball. Transfer to prepared pan and flatten evenly. Chill 30 minutes. Lift mixture from pan and cut into 6 bars. Wrap and store (3 days at room temp, 3 weeks in fridge, 3 months in freezer). These came out too moist. The original recipe called for 2 tsp. coconut oil, but I'd skip that. I ended up processing a couple of graham crackers into the mix to make it more coherent. I added a bit of lemon juice to this, but it will depend upon your apples. I'm really excited that Rosie has picked up the torch on the Sunday outfit posts, and hereby resolve to sail in at the last minute with my poorly-lit pics more often. We spent the weekend moving five yards of manure around the yard, so Mother's Day was pretty low-key here. We did spend an hour at the zoo later in the afternoon, followed by hunting down the only deep-dish pizza in town. At Mass, Thing One was so here there and everywhere in the pew that we actually went through with revoking donut priviledges. Thing Two, in true little brother fashion, proceeded to make Bean look even worse in comparison by pointing out Jesus and "Ai-YU-ya" at every opportunity, while imitating Father's gestures. Dress: ages-old Anthropology (I think I may have actually paid $19). Still wearable courtesy the elastic panel in the back. Sweater: Banana Republic Outlet. I wear it every few months because I forget that small fingers cannot resist poking through the mesh all through Mass. Shoes: Penney's clearance, selected by Peanut. 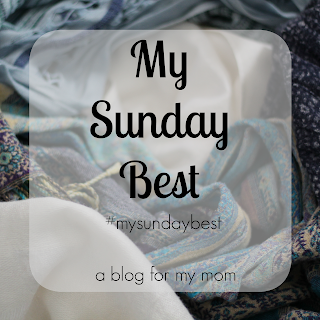 Find more Sunday Best at Rosie's! Anyone who's done the pregnancy size yo-yo a time or three knows how easy it is to end up with a bunch of clothes that you only want to wear for a few months at a time before they cease to be useful or flattering, but you hate to get rid of them because they'll probably be useful for a few more months somewhere down the line. (That goes double if you're nursing, which has its own set of clothes needs.) So, this time around, I've been trying to focus on clothes that I'll actually want to wear for more than one stage of this process. Enter this knit dress, which I hope will replace some well-loved dresses that I borrowed last time around. Even though this fabric was rather hard-won (I was majorly overcharged—not the first time JoAnn has done this—and fixing it involved both the manager and I pulling out our calculators for about 15 minutes before she finally tricked the system into something close enough and we both decided it was time for a margarita), this fabric turned out to be awesome. If you've ever handled Land's End swimwear or some of their knit dresses, it's like that. Very substantial feel, great stretch (about 50% both directions) and recovery, and the edges don't curl or fray. I'm really tempted to go back for more for a blazer. One caveat: like a lot of polyesters, this fabric does seem to hang onto odors, so you might find yourself washing it more frequently than a natural fiber. This pattern is written for woven fabrics, so to adapt it to a stretch knit, I skipped the zipper, and cut the pieces with zero or slight negative ease (I'd decrease the ease even further for a less-stable knit). I skipped the facings to eliminate bulk, and instead extended the bodice front edge to make a 2” turn-under. Eliminating the front edge seam should also make it stretchier and thus easier to pull that edge down for nursing. I cut a wide bias strip (not on the true bias; just parallel with the edge of one of the skirt pieces), and piped the edge of the front yoke and back neck, tacking the seam allowance down in a couple of spots. Since the fabric is so stable, I left the skirt unhemmed. I may revisit that after pregnancy, when I have some hope of marking an even hem, but I'll probably leave it unless the fabric shows some signs of ravelling. For the maternity alterations, the bodice is about 4” shorter than the original pattern. I added a waistband to help transition between the sizes, and also to break up the print a tad. I lengthened the skirt by 1.5” to make up for the shorter bodice, and cut the side edges of each gore straight, instead of with waist shaping. To do this, I traced the top edge onto the fabric, slid the pattern piece straight down 1.5”, and then used a yardstick to trace a line from the top corner to the bottom on each side. Puffed sleeves seemed like a poor choice in this fabric, but I wanted a nice style detail there, so I used this tutorial to make tulip sleeves. I converted the gathers where the bodice attaches to front yoke into pleats, because this fabric was too thick to gather well. I think if I did it over, though, I’d just pin that fullness out of the pattern piece before cutting. It wasn't at all necessary in a knit. I also played fast-and-loose with the grainlines on the layout, placing the front edge parallel to the stripes and cutting the skirt pieces on the crossgrain, since "Do you happen to have any clothes with horizontal stripes?" isn't exactly the question on the lips of pregnant women everywhere. If you're looking for something similar, I'd try New Look 6069 (which seems to be available as a printable pattern only, but Simplicity's site has been a mess since they redesigned it, so it might be worth checking a store). It already has the high waist and waistband that I had to alter this pattern to get. The skirt would need quite a bit of fullness added for maternity, though. The Simplicity pattern is a four-gore half-circle skirt (or very close to it), and the New Look seems to be about half that. There are lots of circle skirt calculators online; just use the waist/length measurements from the pattern to create a new skirt pattern with the correct fullness. 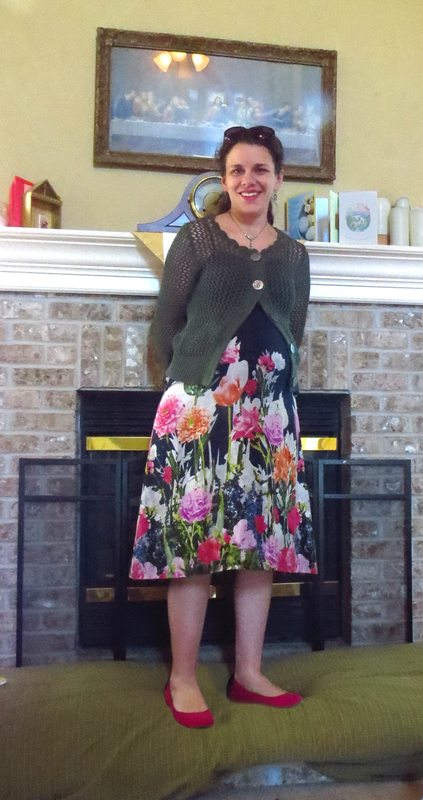 (Other similar patterns: B5030, Simplicity 6301 or 1801). I'm already in love with this dress. As much as I can enjoy the creativity involved in putting together an outfit, it can get a little old when a piece that fit you last week won't zip the next, so I'm glad to be able to look put together with no thought involved! ModCloth Maternity-friendly pieces on sale today! I was going to get a sewing post up today, but then my washing machine flooded, so that kind of killed my photographing mojo. 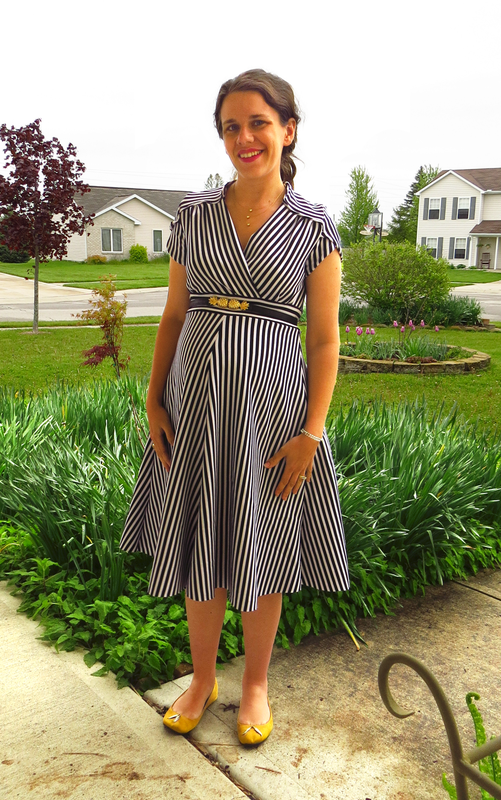 I'm still in the mood to talk about maternity fashion, though, and, lo and behold, ModCloth is having a flash sale today that includes a couple of my most-worn pieces. So, since half of my friends seem to be expecting (and half of my siblings definitely are) let's chat! We'll start with the ones I own. This is my first time due in the summer, so I knew I wanted some light and breezy pieces. The Back Road Ramble Tunic fits the bill with it's lightweight cotton lawn fabric. I found it (in blue, at least) to be opaque enough not to need a cami, but some reviewers disagreed, so be warned. The top button is a little lower than I'd like, so I'm planning to swipe one from the cuffs to raise the neckline a tad. The great thing is that it will provide nursing access, so I plan to get a lot of use out of this one all year round. I purchased one size up from my usual, and I think I'll be able to wear this one till the bitter end. I have this one in the (discontinued) mustard, and I'm not sure I'd pay more than sale price, as it lacks pockets and a lining. The fabric is decently heavy, though, so it's probably okay without a slip, unless you find yourself having VPL issues. I bought a large (actual waistband measurement, 30.5"), and it has plenty of length and fullness to wear it hiked up around my rib cage. and looks great with a cute elastic belt. I wasn't sure how I felt about the high-waisted look at first, but the fact that I can keep using a lot of my button-down blouses—either tucking in the unbutton-able portion or tying it in a cute knot at the waistband—has me sold. It drapes nicely, too, so it doesn't add a bulk where you already have plenty. Okay, now we're moving into less-sure territory, but these seem like reasonable bets. Some of the reviewers complained that this top made them look pregnant, which tends to be a good sign if you're looking for something to wear while actually pregnant. The length runs about the same as the Back Road Ramble Tunic above, so it should work well, providing it's roomy enough. Might be worth checking in with one of their stylists if you're curious. The Pam Breeze-ly Tunic is in a similar vein, though some of the reviews on the green complained that the fabric was high-maintenance. Last is the one that most tempts me. I've seen this one well-reviewed elsewhere (Gertie the sewing blogger/author wears hers all the time), and since it's two full circle skirts stacked together, the sale price is pushing it really close to "cheaper than I could make it" territory, especially when you account for the pain and suffering of hemming two circle skirts. It runs a tad shorter than the Bugle Joy skirt above, so if you are tall or like your skirts longer, you might want to pull out a tape measure to make sure it's what you're looking for. The review photos look deliciously swirly! So, what other great non-maternity maternity pieces have you spotted lately? I've been into maxis lately, which are usually not my style at all, but I'm liking having a little length to balance out the extra width! While it can be stressful in some ways (flying solo with preschoolers for extra-long Masses), the fact that DH works for the Church often suits my procrastinating self just fine. While the (amazing) domestic church goddesses are posting their Paschal candle projects or recipes for empty-tomb cookies, I have a legit excuse to say, "Hmm. We're in survival mode. But, hey, fifty days of Easter!" Not kidding about the survival mode. DH worked during Palm Sunday Mass, and then I saw him for 10 waking minutes out of 64 hours from Sunday night to Wednesday evening. Just go ahead and remember to say a big thank you to your priests, musicians, sacristans, etc. during Holy Week. If you've never seen it from the planning side before, it's intense, y'all. 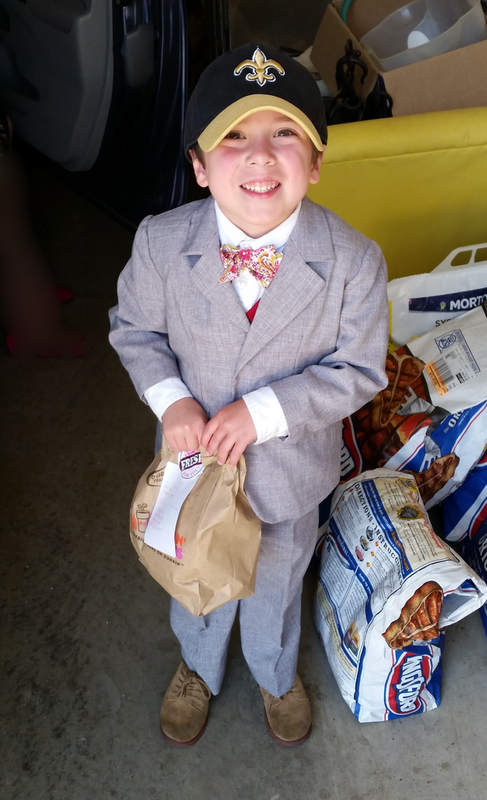 For all that, I could probably get some crafts done, but I have this insane urge to sew new Easter clothes (then again, Bean got a new three-piece suit and tie, exactly how he wanted them, for $23). I just wrote kind of a mega-post on that, so for the best way to sew a boys' bow tie and other minutiae, head on over there. For all the domestic slacking, we do do the liturgical side of things pretty intensely. 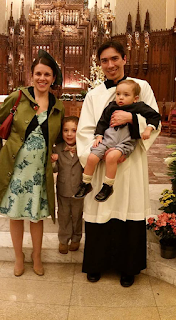 I've always said I'd rather take a kid (maybe not a baby) to a three-hour liturgy with darkness/fire/processions/sprinkling/etc, than a regular Sunday Mass without a lot of effort put into it, and I have yet to be proved wrong on that. We read the stories out of our children's Bible and talked a little bit about what they'd see beforehand, but mostly I just let the liturgy do its thing, and was rewarded with reactions like an audible gasp when the deacon announced the first "Alleluia," or a bit of smart-alekry when I'd told him we wouldn't hear the pipe organ on Good Friday, and then they did use it to give the singers their pitches. But at least I knew he was paying attention. So, what did we actually get done around here? Well, for the first time in a decade or more, I actually braided palms on Palm Sunday. There was the one year of shame where I meant to, then forgot they were in the back of the fridge and they got slimy, but I didn't want to just toss them because they were blessed, and I didn't want to admit my mistake to DH, so I had to try to sneakily find a place to bury them in the yard where he wouldn't notice them. So, this time, I just snagged some (presumably unblessed) from the basket after Mass, and did the blessed ones first, and I'll put them all in the same arrangement once they're dry. So, it's half a sacramental, anyway. I took a class on palm braiding as a kid, so I only needed a refresher, but it seems like the internet tutorials on the subject (in English, anyway) are surprisingly sparse. Would it be of interest to anyone if I got some strips of construction paper and put together some instructions before next year? Feasting on Easter itself was really important to us, though, since we'd gone vegetarian for Lent, and because Monday was another long work day. Brunch included some really fantastic Polish sausage and mackowiec brought by my folks. Dinner was the highly traditional grilled pork chops with applesauce (and NO vegetables! ), followed by homemade vanilla bean ice cream and strawberry rhubarb pie. So, what do you do for Easter? We've got a bit of time and energy, and fourty-five more days to fill here! For more Quick Takes, head over to Kelly's! Warning: lots of sewing details ahead! Bean's jacket and vest are Burda 9781, with the pants being a bit of a frankenstein between that pattern and a flat-front one. There aren't exactly a lot of boy's suit patterns on the market, so you take what you can get, but there are definitely some tweaks in order for this one. I added a back vent (because, um, little boys move). The pattern runs from size 3-9, but there's a lot of differences in proportion between those extremes, so don't assume that the sleeve length is going to work (and the sleeve is tapered, so the side seam will need adjusting if the length does). The pants, for some reason, don't have elastic, darts, or belt loops (I added the latter two), so unless you have suspenders, one of those is going to be a must. Something I'd like to play with in future versions is to lower the roll line on the jacket, so that you can actually see the vest. Still, it's a decent foundation to work from, with a side panel and two-piece sleeves, like a real suit. I used Jo-Ann's Grey Heather suiting for the jacket and pants. It was >$6/yd and easy to work with, but it had the unanticipated problem of being kind of slick, and he has trouble staying on laps in those pants, so be warned. The vest was their Linen Look (which actually contains more linen than some of the fabrics simply labeled "linen"... yeah.) in the required "reddish red" color. (I convinced him that an entire red suit might be a bit much, which is why he must never see this picture.) He's also been requesting a flower tie for months, and he was delighted to find this print in the quilting section. The pattern I used (which really ties, but has a hook on the back so you only need tie it once) seems to have disappeared behind a paywall, but might I humbly suggest that even if you go the three rectangles route for a bow tie, you cut the tie part on the bias? I've done both, and even though it uses more fabric, it's worth it because it stays much perkier. L to R: Straight-grain, bias, real bow. Peanut's jacket is the same one he wore last Easter, and the vest and tie are hand-me-downs from Bean. 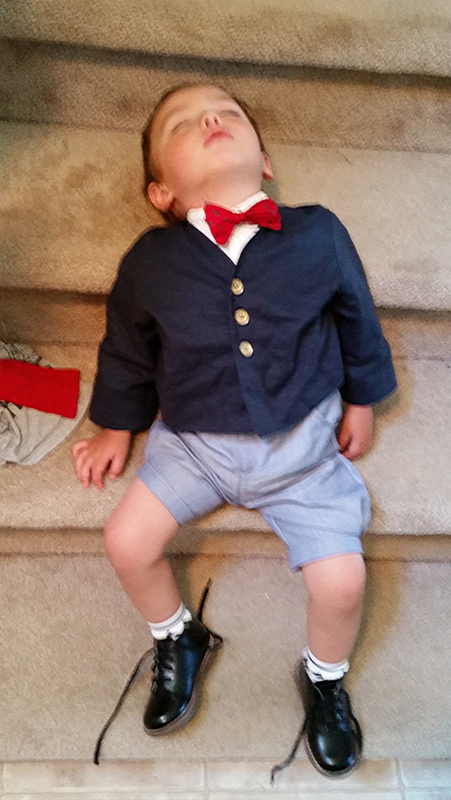 (He usually hates ties, but surprisingly, he was really delighted to have a bow tie like big brother, and insisted on wearing it around the house all afternoon when I tried it on him.) Knickers were from this pattern, I just cut them down to a 4" finished inseam and pleated the bottom edges to fit into a cuff. He also got a matching gatsby cap from Burda 9507 (Simplicity's site has been seriously messed up since they redid it a couple months ago, so I'm honestly not sure if this is still in print.) I've been trying to find a good formula for stiffening cap bills. Kroger has oval-shaped ice cream cartons that I cut apart for baby hats, but he's decidedly toddler size. This time I tried cotton batting quilted between two layers of home dec interfacing, and it was okay, but I'd still prefer stiffer. I'm thinking buckram glued to craft foam for the next round? The fabric for both of these was a mystery synthetic herringbone mill end. A nice spring print, but pressing was nearly useless, and it needed a lot of top stitching to lie nicely. The hat turned out to be a good call, since we were standing outside in the wind for quite a while waiting for the Easter fire. Vintage button score from Etsy. The pattern is basically a lengthened version of Vogue 1037, with some more coat-ish details (hand-warmer pockets and a vent) imported from an OOP coat pattern I had handy. I still have to finish some details like sewing covered snaps on under the buttons, but as I couldn't close them anyway, it wasn't high on my list. The fabric is a stretch sateen that works reasonably well for the application, but can kind of resist pressing (I don't recommend it for set-in sleeves!) The body is lined in a quilting print that makes me happy every time I look at it, with actual lining fabric in the sleeves, so I can get them on! I found the green buttons on clearance at the same time as I was buying the fabric, but there were only four of them, so I added brooch-like vintage button on the top, which inspired the choice to use snaps instead of buttonholes (probably a good move, as stretch fabric buttonholes tend to get wonky-looking with use). With all this deadline sewing, I really focused on what I could do by machine, which means I successfully bagged two jacket linings, with vents! I couldn't find a tutorial for the vent part, which meant a bit of flipping back and forth to get it right, but they're both hanging nicely. I may go back in and hand-stitch a few details, like sleeve hems, now that I can do it at a more relaxed pace, but overall, I'm pretty pleased with all the projects. Hooray for new skills! 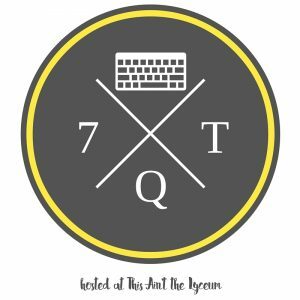 Use this box (or any of the affiliate links throughout the blog) to shop Amazon, and help support this blog! I Smile, of Course, | And go on drinking tea.